Both implementations use agents. The agents handle the HAProxy configuration and manage the HAProxy daemon. LBaaS v2 adds the concept of listeners to the LBaaS v1 load balancers. LBaaS v2 allows you to configure multiple listener ports on a single load balancer IP address. Another LBaaS v2 implementation, Octavia, has a separate API and separate worker processes that build load balancers within virtual machines on hypervisors that are managed by the Compute service. You do not need an agent for Octavia. Currently, no migration path exists between v1 and v2 load balancers. If you choose to switch from v1 to v2, you must recreate all load balancers, pools, and health monitors. The load balancer occupies a neutron network port and has an IP address assigned from a subnet. Load balancers can listen for requests on multiple ports. Each one of those ports is specified by a listener. 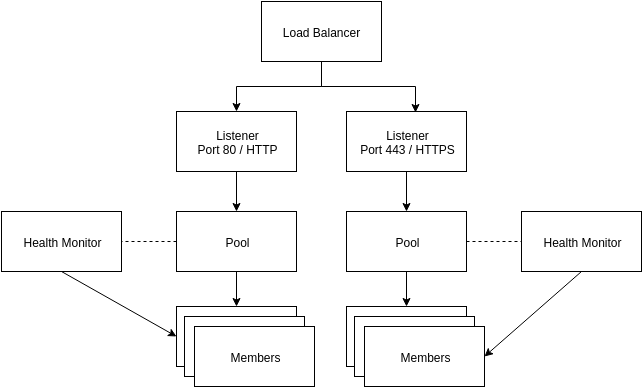 A pool holds a list of members that serve content through the load balancer. Members are servers that serve traffic behind a load balancer. Each member is specified by the IP address and port that it uses to serve traffic. Members may go offline from time to time and health monitors divert traffic away from members that are not responding properly. Health monitors are associated with pools. LBaaS v2 has multiple implementations via different service plug-ins. The two most common implementations use either an agent or the Octavia services. Both implementations use the LBaaS v2 API. If you have existing service providers for other networking service plug-ins, such as VPNaaS or FWaaS, add the service_provider line shown above in the [service_providers] section as a separate line. These configuration directives are repeatable and are not comma-separated. Replace INTERFACE_DRIVER with the interface driver that the layer-2 agent in your environment uses. For example, openvswitch for Open vSwitch or linuxbridge for Linux bridge. If you have deployed LBaaS v1, stop the LBaaS v1 agent now. The v1 and v2 agents cannot run simultaneously. Restart the Network service to activate the new configuration. You are now ready to create load balancers with the LBaaS v2 agent. Octavia provides additional capabilities for load balancers, including using a compute driver to build instances that operate as load balancers. The Hands on Lab - Install and Configure OpenStack Octavia session at the OpenStack Summit in Tokyo provides an overview of Octavia. Ensure that the LBaaS v1 and v2 service providers are removed from the [service_providers] section. They are not used with Octavia. Verify that all LBaaS agents are stopped. Restart the Network service to activate the new configuration. You are now ready to create and manage load balancers with Octavia. The Dashboard panels for managing LBaaS v2 are available starting with the Mitaka release. Copy the _1481_project_ng_loadbalancersv2_panel.py file from the neutron-lbaas-dashboard/enabled directory into the Dashboard openstack_dashboard/local/enabled directory. This step ensures that Dashboard can find the plug-in when it enumerates all of its available panels. Enable the plug-in in Dashboard by editing the local_settings.py file and setting enable_lb to True in the OPENSTACK_NEUTRON_NETWORK dictionary. To find the panel, click on Project in Dashboard, then click the Network drop-down menu and select Load Balancers. The same neutron commands are used for LBaaS v2 with an agent or with Octavia. Update the security group to allow traffic to reach the new load balancer. Create a new security group along with ingress rules to allow traffic into the new load balancer. The neutron port for the load balancer is shown as vip_port_id above. This load balancer is active and ready to serve traffic on 192.168.1.22. PING 192.168.1.22 (192.168.1.22) 56(84) bytes of data. In this example, the load balancer uses the round robin algorithm and the traffic alternates between the web servers on the backend. In this example, the health monitor removes the server from the pool if it fails a health check at two five-second intervals. When the server recovers and begins responding to health checks again, it is added to the pool once again. You can add another listener on port 443 for HTTPS traffic. LBaaS v2 offers SSL/TLS termination at the load balancer, but this example takes a simpler approach and allows encrypted connections to terminate at each member server. The load balancer now handles traffic on ports 80 and 443. Load balancers that are deployed on a public or provider network that are accessible to external clients do not need a floating IP address assigned. External clients can directly access the virtual IP address (VIP) of those load balancers. However, load balancers deployed onto private or isolated networks need a floating IP address assigned if they must be accessible to external clients. To complete this step, you must have a router between the private and public networks and an available floating IP address. Quotas are available for limiting the number of load balancers and load balancer pools. By default, both quotas are set to 10. A setting of -1 disables the quota for a tenant. The active_connections count is the total number of connections that were active at the time the agent polled the load balancer. The other three statistics are cumulative since the load balancer was last started. For example, if the load balancer restarts due to a system error or a configuration change, these statistics will be reset.